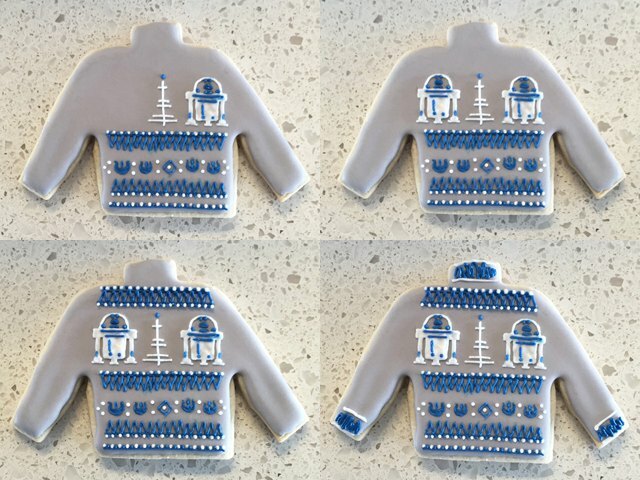 You don't have to travel to a galaxy far, far away to find these cute R2-D2 ugly Christmas sweater cookies. Using this tutorial, you can create your very own droid right at home. The day before, outline and fill the cookie using flood consistency royal icing in gray and a tip #3. Let dry overnight. 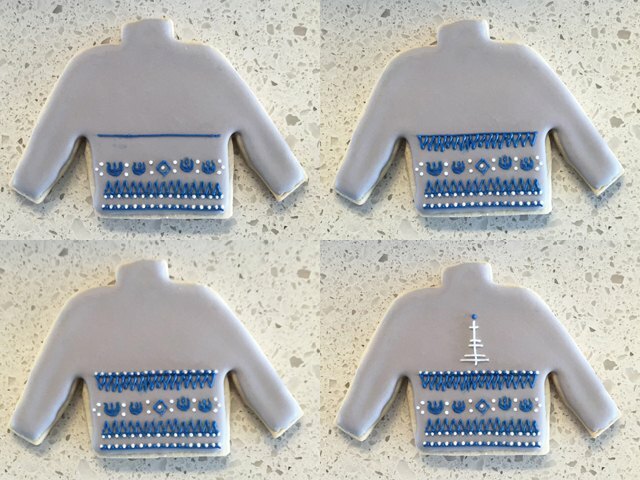 Use medium consistency royal icing in blue to pipe a horizontal line along the bottom of the sweater. Pipe alternating dots of blue and white above the line. Next, pipe a second horizontal line about 1/8" above the first. Pipe alternating dots of blue and white below the line and a zigzag pattern above it. Pipe a white dot inside a blue diamond just above the zigzag pattern. Pipe two white dots on each side. 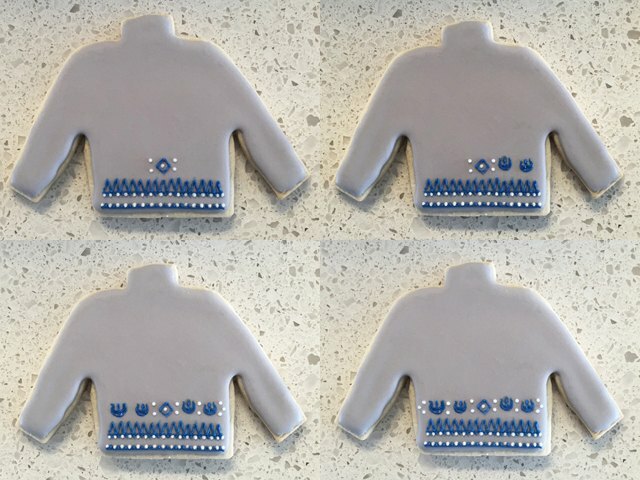 Continue by piping blue royal icing adjacent to the white dots being sure to use a paintbrush to shape it into the Rebel Alliance emblem. Repeat this step three more times until there are four Rebel Alliance emblems. Finish by piping a few more white dots between each emblem. Pipe a third blue horizontal line above the emblems, giving enough space to pipe a zigzag pattern underneath the line. Top it off with alternating dots in blue and white. 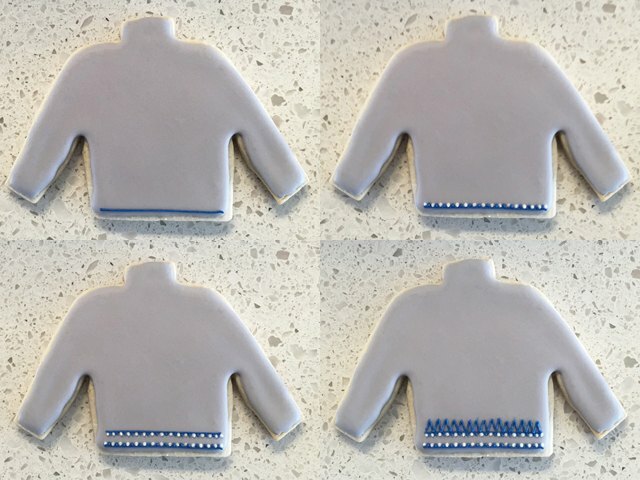 Using white royal icing, pipe a vertical line down the center of the sweater followed by a few short horizontal lines that cross over the vertical. Pipe a blue dot at the top--this is your Christmas tree. To make R2-D2, start by piping two vertical lines for his legs and feet. In the center, pipe a square with very short line for the third wheel along the bottom. Pipe a horizontal line along the top of the square that extends just beyond his legs to connect them all. Lastly, pipe a half-circle for his head. 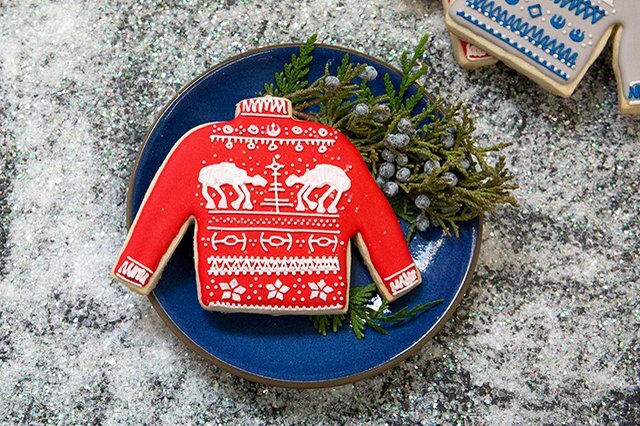 Use a paintbrush lightly dipped in vodka or extract to help shape the icing. Continue by piping the details inside R2-D2 using blue royal icing. 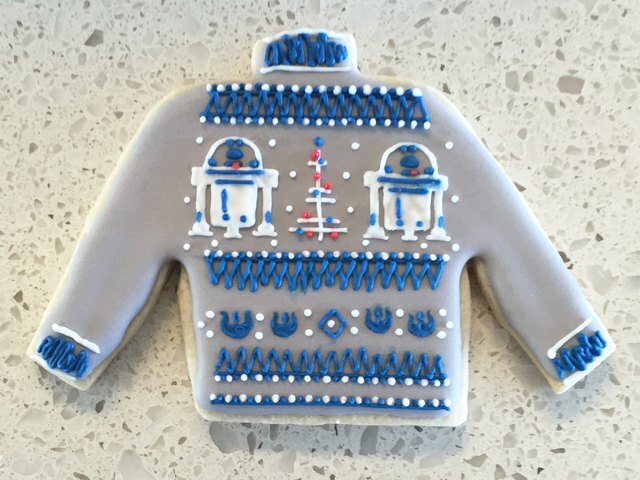 Repeat this process to make a second R2-D2 on the sweater. Next, pipe two blue horizontal lines about 1/8" apart above the R2-D2 units. Pipe a zigzag pattern inside the two lines then alternating dots of blue and white along the outside. Add detailing on the neck and sleeves so the sweater is not too bare everywhere else. 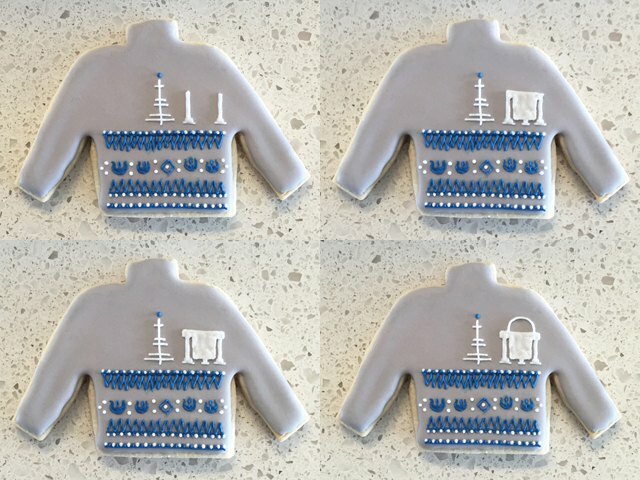 Use white royal icing to pipe snow around the droid units. 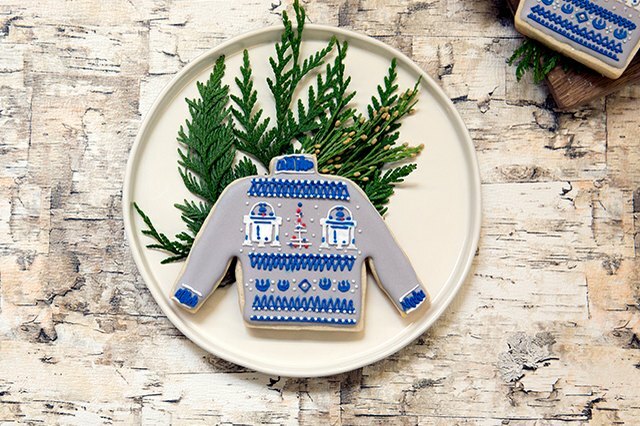 Finish the sweater by piping red and blue ornaments on the tree and a red dot for his processing unit.